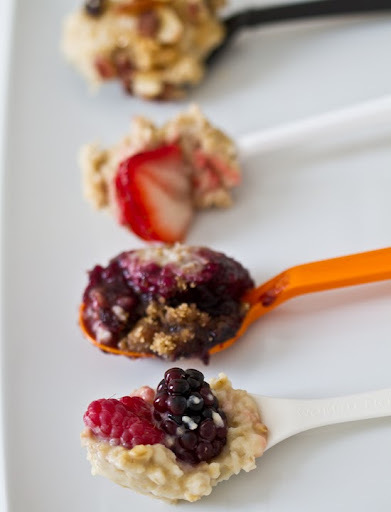 Oatmeal On-the-Go Taste Test! Vegan Options. I'm not quite certain you can classify oatmeal as a dining trend, but it certainly is a breakfast staple here in America. And yes, maybe timeless oatmeal has even become a tiny bit 'trendy'. 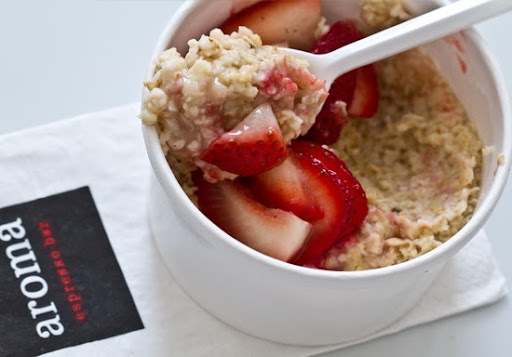 Here in NYC, and I imagine most places, if you peruse the breakfast menu of almost any restaurant, you're sure to find "their (classic or modern) take" on a simple, healthy bowl of oats. 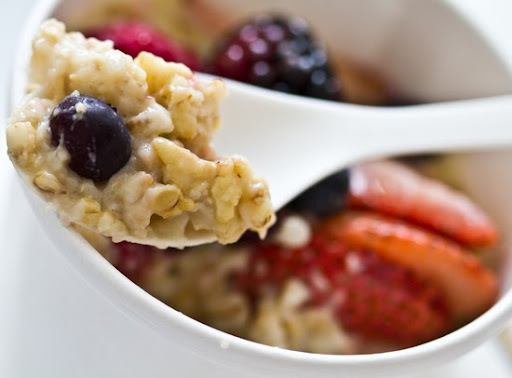 Breakfast Oatmeal: Slow-Cooked Gets Speedy. 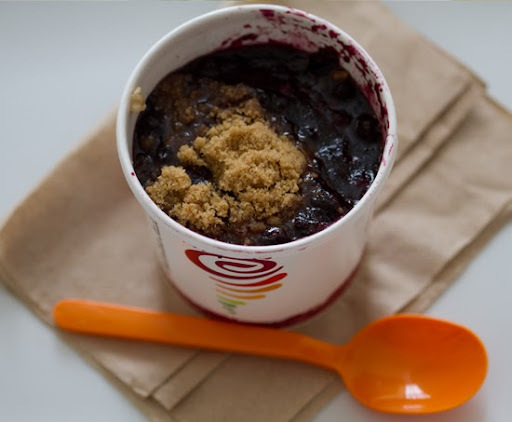 Over a year ago, two major 'fast' food brands, Jamba Juice and Starbucks unveiled their take on oatmeal (as well as a few other big name brands). And fast food oatmeal may be a diamond in the rough. 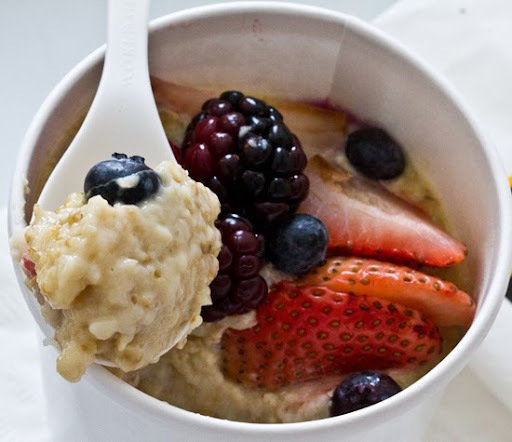 Let's face it, compared to most fast food breakfast options, oatmeal is a quite nutritious, vegan-friendly option. And a bowl of warm oatmeal (made cravable by some fresh fruit, nuts, maple and/or spice accents on top) sure beats skipping breakfast altogether on a chilly fall or winter morning. Seasonal Mornings. I've brought out my boots, and I'm considering placing my scarf in the 'ready' position on the hook by the front door. The fall (and winter) days ahead will no doubt bring cool, crisp and chilly mornings at my doorstep and I want to be ready for them! Cocoa in the pantry, cinnamon sticks on the spice rack and plenty of warm bowl options for breakfast. Homemade is Best. Despite the array of amazing to-go and dine-in options, homemade, when your life can manage it, is usually best. And while I'd love to eat lavish drawn-out breakfasts, seated, sunlit, slippers still on as I flip through the morning paper (what's that?) and slowly savor my fruit bowl and tea, the everyday reality is nothing as I might imagine in my "breakfast fantasy". ..Thank goodness for the weekends where hopefully we can all sit down and savor our bevie, bowl and fruit (slippers on). But if you're like most people, including myself on a busy day, to-go breakfast options are the only thing that stand between you and a stone cold, empty, growling afternoon tummy. So if you are breakfasting on-the-go and oatmeal is what you crave, give my Oatmeal Taste Test a look, and you might find something inspiring (or at least better know what you are looking for in a bowl of to-go oats). I then transported them home (they sat for about about 15-20 minutes before I could dig in). I chose brands that I easily frequent here in NYC. Starbucks and Jamba Juice are the two most pedestrian brands in my taste test. But even if these brands are different from your oatmeal options, look over my comments and you may be more informed on how to weed out bad (and find good) on-the-go oatmeal options. My Review Process: I scored each oatmeal on taste/texture/toppings/milk options. The totaled scores at the end are important, but also read my tasting notes/descriptions. You'll want to take note of the price/nutrition - as they are not factored into the number scoring. scores are from 1-5, 5 being the best, 1 being the worst. 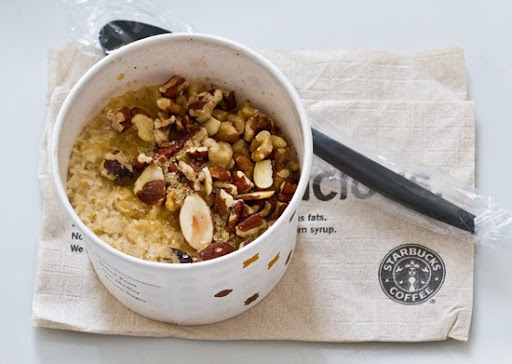 Aroma - $3.25 "Warm and Delicious Oatmeal"
Starbucks - $2.45 "Perfect Oatmeal" Hearty, 100% whole grain oatmeal. 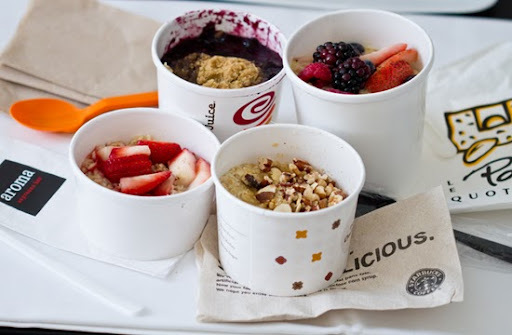 Jamba Juice - $1 w/ promotion/beverage purchase ($2.95-$3.25 w/o) "Slow Cooked Steel-Cut"
Le Pain Quotidien - $5.50 (varies) "Organic Steel-Cut Oatmeal with berries"
Aroma - Options include a variety of fresh fruit. Asked if I wanted water or milk base. I chose water and fresh strawberries. Berries were average, fresh, but a tad soggy. vegan-friendly. Starbucks - Asked if I wanted brown sugar, dried fruit or nuts. I chose the nuts. They cam in a little packet, nice flavor and quality of nuts. vegan. 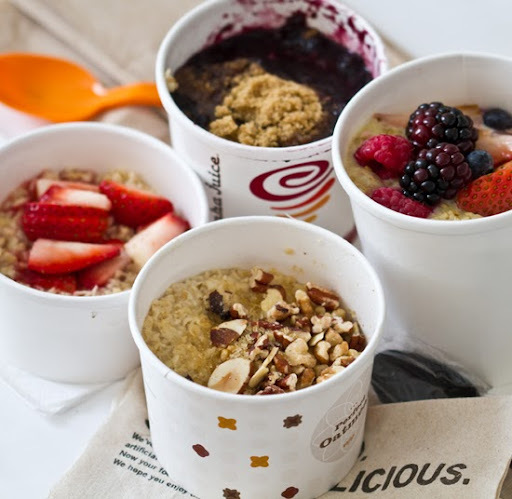 Jamba Juice - A variety of toppings. I chose blueberry/blackberry combo. Also came with a big scoop of brown sugar. Berries had a nice taste, but they were not fresh and overall the topping was way too much and overly sweet. Ask for no brown sugar (or on the side) if you don't like 'overly sweet' oatmeal. vegan. Le Pain Quotidien - Fresh berries is standard garnish. I add a drizzle of agave syrup which is available at the counter. Maple syrup and a dash of cinnamon would make these toppings perfect. Specified soy milk oatmeal. vegan-friendly. Aroma - Dry, slightly mushy. Grains were visible, but the oats were flat and very sticky. Missing a nuttier texture. May be better if they used milk - but since they did not have a soy option, not possible for a vegan. Starbucks - Reminds me of the texture I get from an instant microwave oatmeal pack. Slightly slimy and lacking hearty thick cut oats. Slightly pasty to chew. Nice and moist, however, not dry. Sticky. 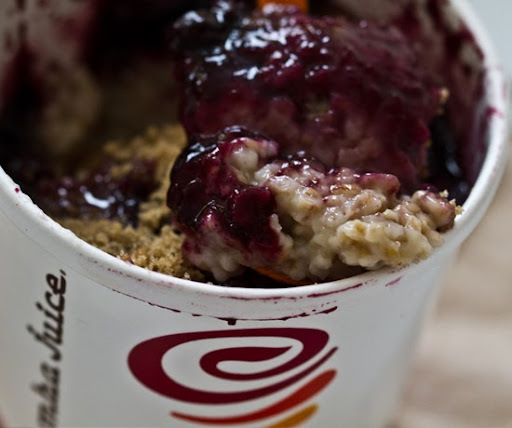 Jamba Juice - Nice mix of nutty thick oats and moist softer oats. Bumpy texture with a proper amount of 'slow-cooked' moisture. Not slimy or mushy. Medium-light fluffiness. Nice chewiness. 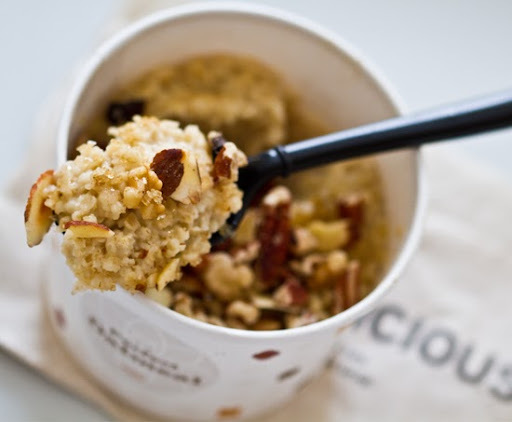 Le Pain Quotidien - Perfect amount of moist soft oats and nutty thick-cut oats. No slime at all. Fluffy and lightest of all the oatmeal. Aroma - Slightly salty, not sweet at all. The dry, dense texture really takes over any pleasant flavor. Bitter, grain flavor is dominant. Needed some sweetness, nuttiness and moisture, badly. Starbucks - Nice caramel taste, slightly sweet/salty. A bit of a vanilla flavor. Lacking greatly in nuttiness and warmth to the flavor. Aftertaste is slightly metallic. Jamba Juice - Lovely bright nuttiness. Smooth flavor. Balanced. Nuttiest flavor of the bunch. Le Pain Quotidien - Pure nutty, rustic flavor. Balanced warm flavors which let the texture and fluffiness of the oats sing. Slight bright oat tones are reminiscent of a tapioca or custard. I must say the most fascinating thing about this taste test was how I found Jamba Juice to be drastically better than Starbucks. 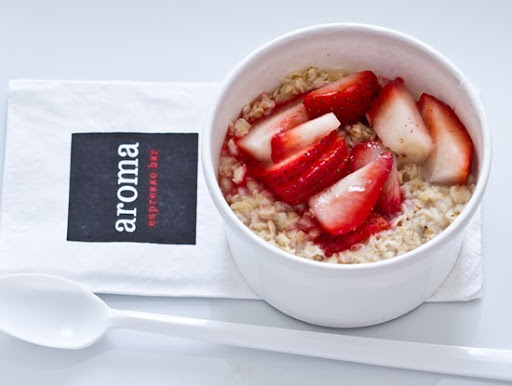 I was quite disappointed by Aroma, and I probably will not be going back there for oatmeal - although their sandwiches/salads/bevies are fantastic. 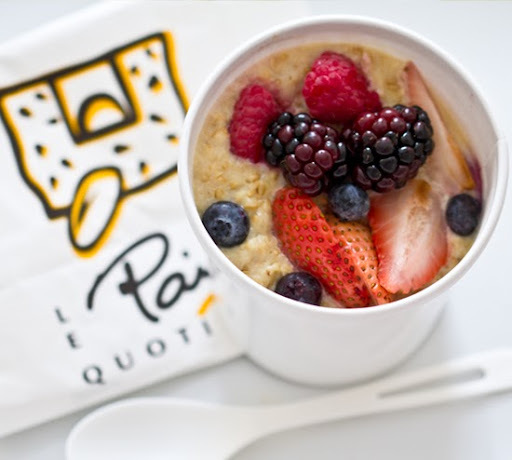 Le Pain's oatmeal was my favorite - I could really taste the natural, organic flavors and textures. Starbucks was the biggest disappointment. There was really nothing "perfect" about that oatmeal. Although the price is right if you are desperate for a healthy, warm bite in the morning. And if you grab a Jamba Juice oatmeal (which I recommend you give a try) be sure to tell them you want toppings on the side - or at least specify that you don't want it too sweet. If that fails, simply scoop off some of the over-done topping. The oats are impressive for a truly fast food chain.